A new study suggests honeybees inherently understand the rudiments of addition and subtraction, a finding that highlights the remarkable cognitive abilities among even the tiniest of creatures. Critics, on the other hand, say the new research proves nothing of the sort. In this latest study, published today in Science Advances, honeybees are shown to exhibit the capacity for basic arithmetic, challenging our understanding of how brain size influences brain power. Big cognitive things, this research suggests, can come from small packages. In addition to shedding new light on insectoid intelligence, the new research could be of benefit in AI research and the development of rapid computational modes of learning and problem-solving. In experiments conducted by scientists from RMIT University in Melbourne, Australia, honeybees were shown to perform simple adding and subtracting, allowing them to successfully navigate a maze to reach a food reward. A scientist we spoke to, however, agrees that bees are smart but found the new evidence unconvincing. 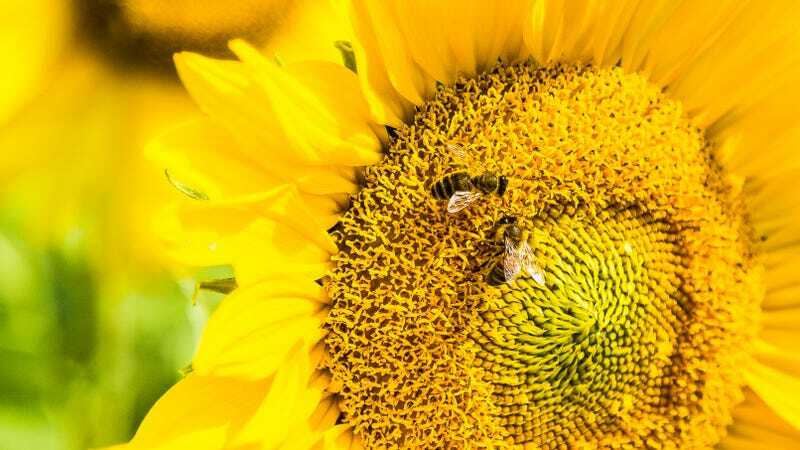 If this research sounds familiar, you’re probably thinking of a study put out last year by the same group of scientists, led by RMIT entomologist Adrian Dyer, showing that honeybees are capable of understanding the concept of zero. Now, that may not sound like a particularly impressive ability, but it’s a capacity rarely seen in nature, with only a handful of nonhuman animals capable of the feat, including some primates and the African grey parrot. As for the ability to do simple arithmetic, that’s also rarely seen in nature, with some primates, birds, and even spiders exhibiting the capacity, according to the new study. That bees might also be able to do it is not a huge stretch, especially considering the prior observation of their ability to grok the concept of zero. Furthermore, these industrious insects have shown their smarts in several other areas, demonstrating the ability to understand concepts like “same” and “different,” counting (a trait known as numerosity), and to learn skills from other bees. With this in mind, Dyer and his colleagues devised an experiment to see if bees can process numbers in the form of addition and subtraction—a capacity requiring some fancy mental skills, such as the ability to organize numbers, apply complex rules, and exhibit functional short-term working memory. For the experiment, honeybees were exposed to a simple Y-shaped maze, where one path led to a sweet treat in the form of sugar water (positive reinforcement) and the other path led to a bitter quinine solution (negative reinforcement). At the entrance to this maze, however, the bees were presented with a visual cue, or stimulus, consisting of anywhere from one to five shapes. The shapes were either blue or yellow, in which blue signified the need to add and yellow meant subtraction. These elements were changed randomly throughout the experiment to prevent the bees from getting wise to what was going on. After observing the display at the entrance, the honeybees entered into a decision chamber, where they were simultaneously presented with two more visual elements. In some cases, the number of shapes matched the one at the entrance, and in other cases the number of shapes was either one more or one less than the display out front. To get the correct answer, and thus access the sugar water, the bees had to learn that blue meant adding one shape to the element, and yellow meant subtracting one. Diagram of the experiment in which a bee is expected to perform addition, as signified by blue elements. So for example, say a bee saw two blue squares at the entrance. Once inside the decision chamber, it sees a pair of elements, one consisting of three blue squares and one consisting of one blue square. Because blue signifies the addition of one element, the bee needs to choose the path corresponding to three blue squares, because 2 (from the entrance) plus 1 equals 3 (as shown in the decision chamber). Even bees exhibit a learning curve when learning new tasks. As the trial progressed, the proportion of correct choices (shown as a percentage) increased. Sounds like a daunting task for a bee to learn, but they figured it out. At first, the bees made random choices, but they eventually worked out the problem. After 100 learning trials requiring between four to seven hours of training, all 14 honeybees involved in the experiment learned that blue meant plus-one and yellow meant minus-1. The bees then appeared to use this acquired knowledge to do the required math inside the decision chamber to reach the reward. The bees weren’t perfect, failing about 20 to 30 percent of the time after around 100 trials, but they “performed at a level that was significantly different from chance,” the authors wrote in the study. When asked if something other than math skills were influencing this observed behavior, Dyer told Gizmodo that the study was “designed to formally test addition and subtraction,” and that “a wide range of stimuli shapes and elements” were used to exclude other possible explanations. Because “bees could transfer their learning to novel stimuli, we are very confident in the result,” he told Gizmodo. Clint Perry, an expert on invertebrate intelligence from the Bee Sensory and Behavioral Ecology Lab at Queen Mary University of London, disagreed, saying the researchers didn’t fully consider alternative strategies used by the bees. Perry, who wasn’t involved with the new study, said low-level visual cues and simpler cognitive strategies were not controlled or tested for in the experiment. It would have been much simpler he said, for the bees to learn a “similar to” rule—a strategy he says would’ve produced similar results. For example, perhaps the bees were perceiving something like “greater surface area” or “less surface area,” or something else the scientists haven’t considered, rather than the quantity of elements. If honeybees are indeed capable of math, Dyer said his team’s findings could be used in AI. Indeed, current methods like deep learning typically require a large number of learning events to solve new problems, but the bees were able to do it with surprising efficiency. An exciting prospect, to be sure. But as Perry pointed out, more work needs to be done to solidify the claim that honeybees can actually do arithmetic. There’s little question that bee brains are very busy, and it’ll be to our benefit to learn as much about these extraordinary insects as possible.